← Bp. 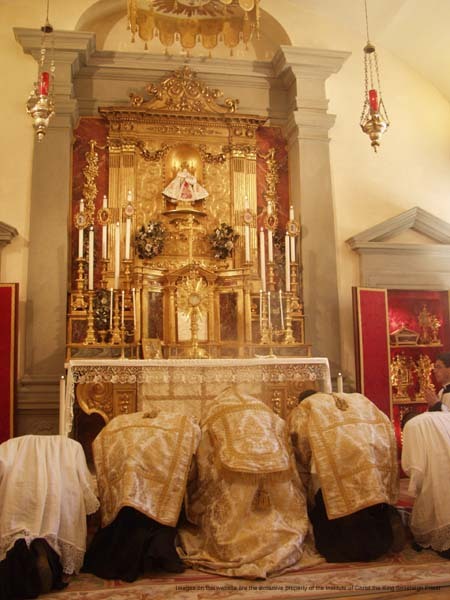 Burbidge of Raleigh, NC on Summorum Pontificum. The Motu Proprio Summorum Pontificum is one dimension of Pope Benedict XVI’s larger vision for the Church, his ecclesiastical "Marshall Plan". Why do we need the usus antiquior on a wider and more generous basis? To correct and redirect, reorient, the way we use the newer form of Mass. For example, take a look at this photo of an ordination in Gricigliano, Italy, where the Institute of Christ the King has its HQ. The ordaining bishop is His Eminence Antonio Card. Cañizares Llovera, Archbishop of Toldeo and Primate of Spain. Here is the singing of a Solemn Te Deum by His Eminence Ennio Card. Antonelli, Archbishop of Florence. Cardinal Llovera is also present. This communicates something about style…. attitude. It doesn’t mean that parishes have to do this… unless they want to, of course. Magnificent, Father! Best posting ever. Indeed, Cathedrals ought to, and what is being done through the work of the Institute is a sublime grace to the Church communicating volumes. An antiquarian question. Aren’t they trying to achieve a position of the Cardinal’s cope while kneeling (surrounding what in this case looks like a faldstool) that was only possible for the Pope, since his cope was larger than normal? Antonius: Please understand…. this is about the older form of liturgy, not the Institute. Those are splendid pictures, but actual Novus Ordo celebrations of that kind are fewer than hen’s teeth. This is the crossed-finger approach. If the real desire of the Holy Father and “reform of the reformers” is to revitalize the Novus Ordo, if they are serious about saving it (God knows why), what’s wrong with the direct approach? Why not make the foremost point of a “new liturgical movement” an all-out campaign before the Holy See to re-write the instruction book, and re-issue the GIRM with concrete, exact, traditional rubrics? Get rid of the ambiguity, cancel the options. That’s a real solution. Anything less is just wishful thinking. Very good point, Belloc, although I would put it in a different manner. I think there’s a danger to such an immediate and sudden refocusing of the liturgy to traditional forms. Yes, we’re faced with bad liturgies that are heavily influenced by Protestant practices. There are some that have gone so far as to be sacreligious. But there is a danger in simply throwing down the gauntlet. One result of the sudden shock will be the alienation of flaky Catholics, the sort who only go to mass on occasion and don’t have any real conviction behind their faith. Another danger is a split with the “reformers,” either those who are satisfied with the reforms, or those who are seeking further, and often impossible, changes. Might we be better off without such people? Perhaps, but the Church is in the business of saving souls. I look forward to the day when the Church, as a whole, has returned to the notions of tradition and beauty and holiness, but I can’t realistically expect hat day to be tomorrow. Belloc: Why not make the foremost point of a â€œnew liturgical movementâ€ an all-out campaign before the Holy See to re-write the instruction book, and re-issue the GIRM with concrete, exact, traditional rubrics? Get rid of the ambiguity, cancel the options. Thatâ€™s a real solution. What a nice surprise – I didn’t know that Cardinal CaÃ±izares, apart from being an integral player on Team Benedict, was also friendly enough towards the extraordinary form to merit an invitation to Gricigliano! If only he himself would celebrate a Solemn High Pontifical Mass in the classical Mozarabic rite (not the post-Vatican II revision in Spanish), whose mother church is his own Cathedral in Toledo. But maybe I’ve got the two interchanged. Suppose I think of a faithful Catholic somewhere between the Sun (old Mass) and marble (new Mass). Under their respective gravitational attractions, which form does the believer naturally incline towards? Hmm …..
An actual Offertory would certainly be part of the “real solution”, along with suppression of that outrageous plethora of eucharistic rayers. Are you aware that this past May, Bishop Fellay of the SSPX stated that your solution is even now quietly afoot? I’ve seen the conference. He claims that Benedict wants to, in his phrase, “make the 1970 Missal more Catholic.” To do this, Fellay said the Holy Father will include the TLM Offertory as an option, and will suppress all eucharistic prayers with the exception of Prayer III and the Roman Canon. They look kind of squished together and elongated, but that’s OK — it gives the scene an El Greco look, and what could be more Counter-Reformation than that? That is really a foretaste of heaven! You cannot imagine the fury of the commentaries in the Spanish press and blogs against Cardinal CaÃ±izares. His pictures in Gricigliano, particularly those with cappa magna, have been ridiculed beyond excess. Melo, you wouldn’t happen to have some links to Spanish reports of Cardinal CaÃ±izares and his visit to Gricigliano in particular? Belloc: Are you aware that this past May, Bishop Fellay of the SSPX stated that your solution is even now quietly afoot? Let’s hope His Excellency is as well-informed about the reform of the reform as he seems to have been about the motu proprio. Who are those in the black and blue vestments in the first picture? I believe that is the Choir Dress for the Insitute. That what was worn in St. Lewis this summer. That, of course, is an Italian Carabinieri police officer in full parade uniform. I’m with Caccia here … the brauvura touch is exactly right. However, the Squished Together look is a distraction, I’m afraid. I’ve been in these situations in composing Web pages before, and the only thing for it is to put proportional height and width declarations in the “img src” code. You have to know the pixel height and width of the original pic, then reduce each by the same percentage. On another matter — As Father Z states: It doesnâ€™t mean that parishes have to do thisâ€¦ unless they want to, of course. Cathedrals ought to. For those that agree with Father Z that cathedrals ought to, you might want to have a look at this. The black and blue that you see is in fact the new choir dress for the Institute. The blue mozetta is worn by the superiors of the Institute while the other members wear a black mozetta with blue trim. They also all have black birettas with blue tuft. The US members of the Institute were presented with their new choir dress in June just prior to the ordinations conducted by His Excellency Archbishop Burke of St. Louis. It is so obvious what or rather Who the focus of this Mass and Benediction is! Antonius – Below I copy a link from a Spanish blog mocking Cardinal CaÃ±izares for this celebration at Gricigliano. I think it’s a liberal Catholic blog. Even from it’s title “The Long Red Cape of Cardinal CaÃ±izares,” you can get a feel for the post’s tone of mockery. For what it’s worth, at least we can see a couple more images of the celebration. God bless His Eminence for swimming against the current like this, which in Spain, can be overwhelming. Please pray for him and other bishops of similar resolve and courage. If there is a convergence of the two rites, and the 1962 Missal is updated with saints’ feasts, will that mean that all the missals that everyone is buying will be obsolete? Will they then need to turn around and buy a new missal that has the new feast days? Having read JRatzinger’s writings on liturgy, I had thought that the first move would be instituting ad orientem for Novus Ordo masses. No language excuse, etc. Instead, they decided to start by re-introducing the 1962 Missal. Good enough.